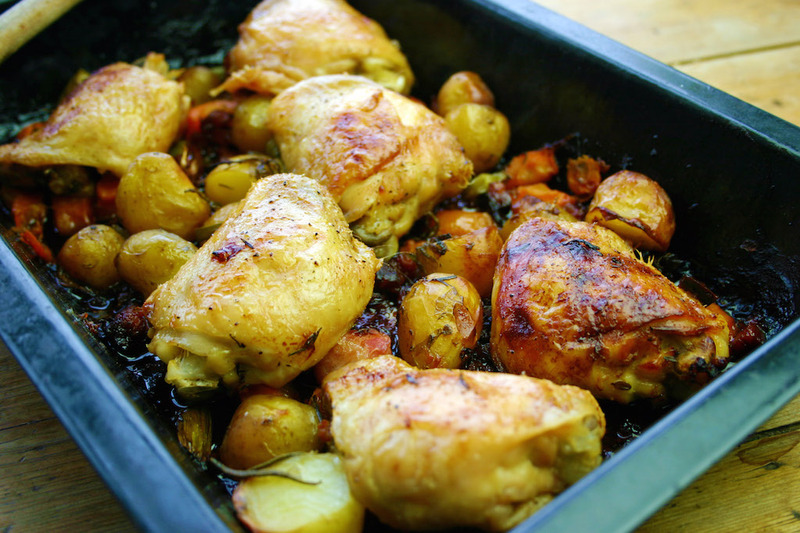 it’s been such a long time since i’ve blogged about my dear chicken thighs that I thought I ought to bring them back with a bang! Such a wonderfully versatile and tasty part of the chicken and so inexpensive they are begging to be bought. The great thing about them that I adore is that, as long as you use the ones with the skin on and the bone in then they’re self-basting as they produce a lot of juicy fats that cook themselves and all the vegetables you cook with them… with the added glory of the cubes of chorizo this was the perfect lazy-day dish to serve for friends with whom id rather spend more time than slaving away in the kitchen… you barely have to do anything except take the glory of the final dish! 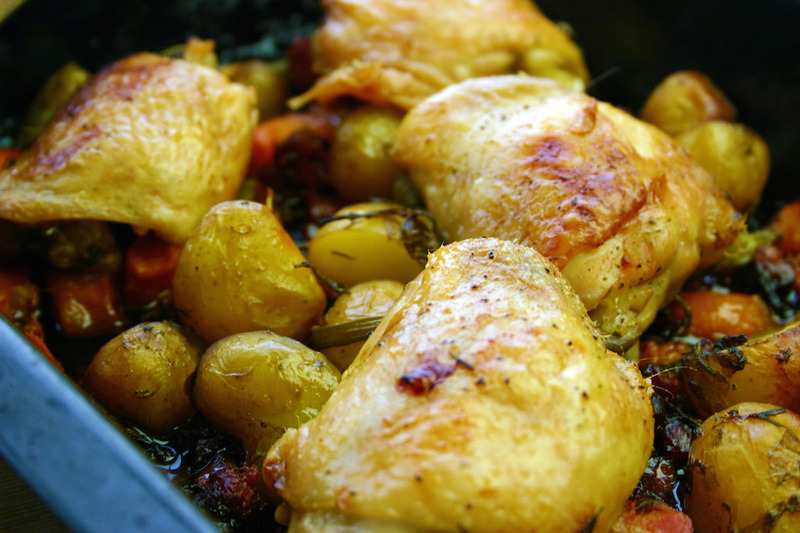 Thighs are definitely our favourite chicken cut. Always so moist and juicy, however you do them! 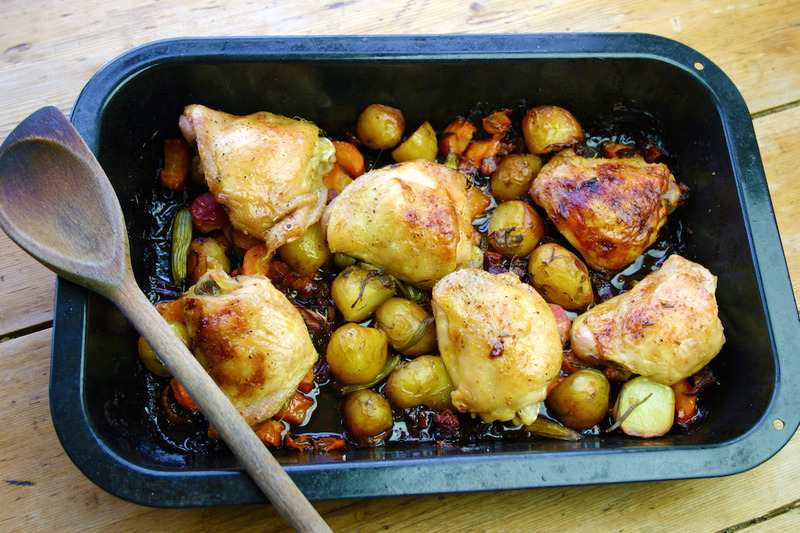 Love chicken with chorizo too and those potatoes look so crisp and inviting. I can almost taste those salty, herby, crispy chicken skins! Can I come for tea please? Love chicken thighs they are so versatile. Chorizo adds that extra burst of flavour. Also good in chilli dishes too.